For years, tech companies like Tesla and Otto have been developing driverless trucks. In 2016, Otto’s driverless semi-truck drove for 120 miles autonomously on the highway to deliver 50,000 cans of Budweiser. 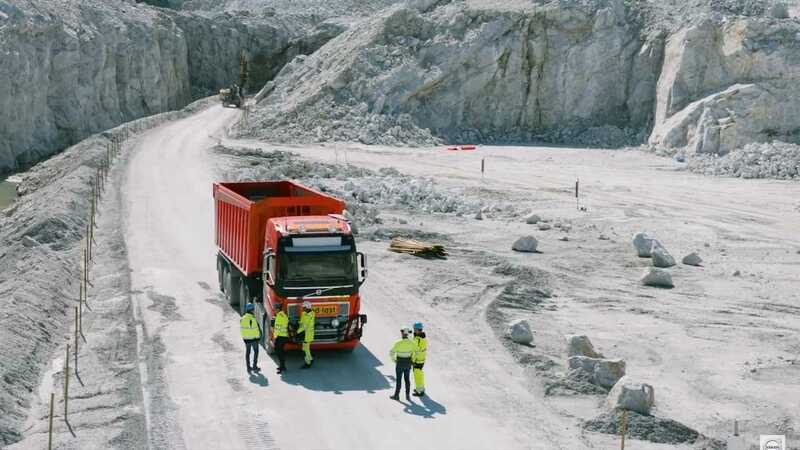 As of recently, Volvo Trucks took autonomy to the next level by commissioning six FH16 driverless trucks to be used to transport limestone for Norwegian mining company Brønnøy Kalk AS. For the very first real-world test, two safety drivers will be sitting behind the wheel, but the truck will be absolutely autonomous. The start of the five kilometer (3.1 mile) trek starts in an open pit where the truck will be filled with limestone. From there the truck will drive 100 meters from the open pit until reaching a tunnel that stretches for 3.5km (2.1 miles). The FH16 will take a short turn after that before entering a second tunnel, this one 800 meters long. At the end of the second tunnel, the trucks enters the crusher site. Here, the truck gets into position to reverse back into the crusher where the limestone is dumped into. The truck carefully carries out its directive and the operation becomes a huge success with its first real-world test, a massive milestone for the company. Volvo aims to provide its customers with greater flexibility and efficiency. With this new technology, the company will supply advanced tailored solutions for clients, which will lead to increased productivity.